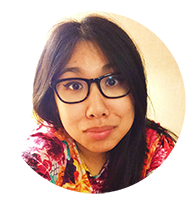 Today I'll be sharing a recipe for Caramel Suprises. 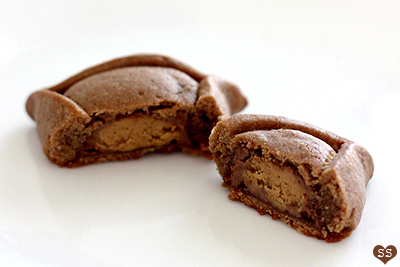 After making those cookies filled with peanut butter cups last time, I got the urge to make more stuffed cookies. I seem to be getting fond of this type of cookie that has a little something unexpected hidden inside. Caramel, chocolate, and shortbread just work. 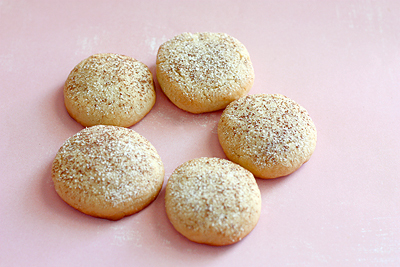 The slightly melted chocolate, the perfectly gooey caramel, and the buttery sandy shortbread: three very different textures and tastes that turn each bite of the seemingly simple cookie into an exciting experience for the taste buds. Plus, they're pretty darn cute with the slight dusting of cocoa powder and powdered sugar. 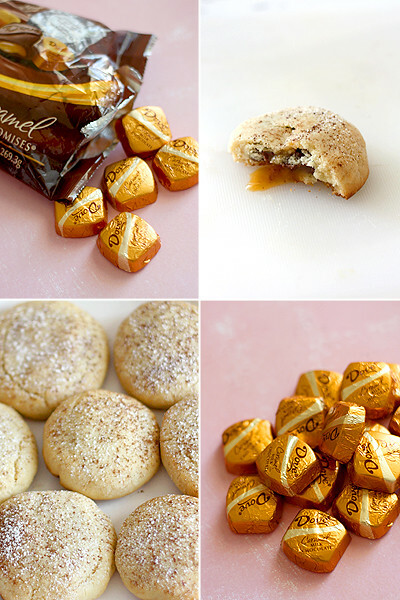 Next time you have a bag of chocolate covered caramels, definitely try these out. They aren't difficult to make; the dough ended up pretty easy to shape around the candies. And the chocolate around the caramel adds another element of surprise to the cookies with no extra work on your part. 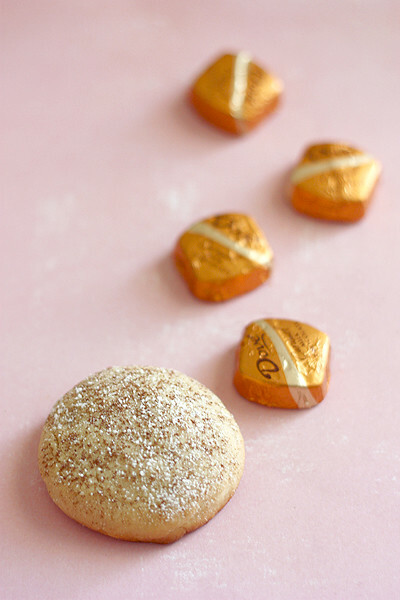 Rather than just shortbread and caramel, it becomes shortbread surrounding caramel surrounding chocolate. The weather is sunny once again, so I'll be continuing with last posts's pirate theme. I realized that I didn't make a single reference to Pirates of the Caribbean in my last post, which is odd because when I think "pirates," Disney's POTC always comes to mind. 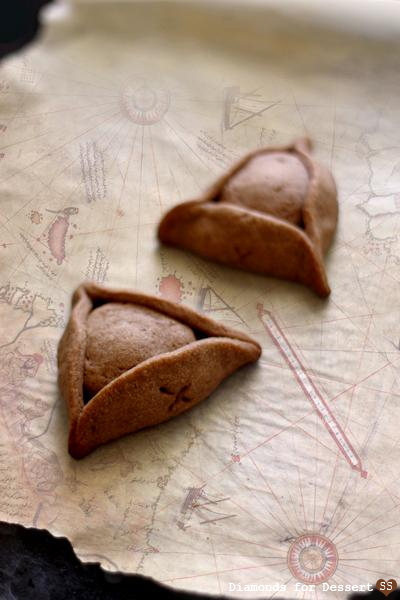 Well, I'll make up for that today since I made Tricorne Cookies. What's a tricorne? It's a three cornered hat that was popular back in the early 18th century. 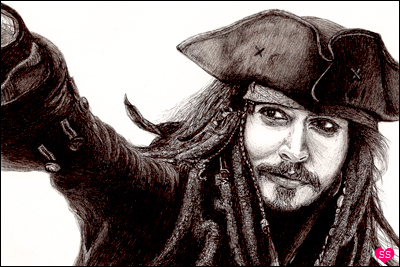 An example of this style of headwear is of course Jack Sparrow's hat. I had a bag of peanut butter cups lying around and I thought it would be cute to make little chocolate pirate hat cookies stuffed with PB cups, like nuggets of hidden treasure in each hat. On another note, did you know that there's going to be a fourth movie, Pirates of the Caribbean: On Stranger Tides (May 2011)? I just found out today as I was Wikipedia-ing info on Jack's hat. Enjoy!